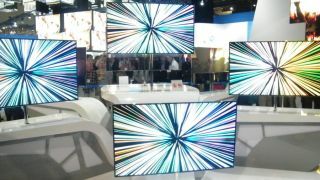 Samsung has revealed that its big-screen OLED adventure is set to happen in 2012, with its 55-inch OLED TVs due for launch in the second half of the year. The company has been coy about the mass production of its OLED sets but the head of Samsung's TV operations has confirmed that they will be out in the second half of the year and also warned that they will come at a price. "The initial OLED models will be the most premium of premium TVs," said Kim Hyun-souk about the upcoming launch of its TV range. OLED has always been an expensive alternative to LCD, so it was something of a surprise that both LG and Samsung announced that they would launch a 55-inch TV with this technology in the market - with Samsung calling its version the ES9500. Sony had tried but failed to pique interest in OLED, with the launch of the Sony XEL-1 – which was the world's first OLED TV. At 11 inches, though, it was a set strictly for those who wanted to adorn their desk with an expensive toy. The thing cost a massive £3,489. Skip three years and the pricing of the Samsung 55-inch OLED is still eye-watering at around 11 million won, which equates to nearly £6,000 ($9,600). But there is 44-inches extra screen space for the money. Given that Samsung own 21.4 per cent of the TV market, it is betting big that OLED will be a success and presumably hoping the world's economy starts to pick up before the official launch.